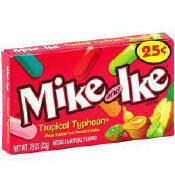 Fruity, chewy MIKE AND IKE candies have been a sweet shop staple since the 1940’s. Since then, the company has developed five different, but equally addictive, flavor mixes along with several sister products. With only 7 calories and 0 grams of fat per candy, MIKE AND IKE will be satisfying the world for years to come.